Gulf Coast residents returning to flood-damaged homes in the wake of Hurricane Harvey – and many people in the Caribbean and Florida after Irma – have a long road ahead of them. We spoke with Austin, Texas, builder Matt Risinger, who’s been making trips to Houston as a volunteer with his church group to help people demo their homes and begin the drying process. He’s been documenting this on his blog, Instagram feed and YouTube channel. Here, he offers tips to homeowners on how to proceed once the waters recede. Be sure to check out his video below for more instructions. We’ve also included advice from the Federal Emergency Management Agency, Red Cross and Department of Housing and Urban Development. First, don’t get overanxious. Your house needs time to dry out. Realize that the process of demolition and rebuilding will take time — months, even years — so settle in for a long haul. It can be stressful, so try to prepare for it and seek help or counseling if needed. Document everything with photos and video for an insurance claim. But Risinger says not to wait for an adjuster to show up before you start working on getting your house dry. 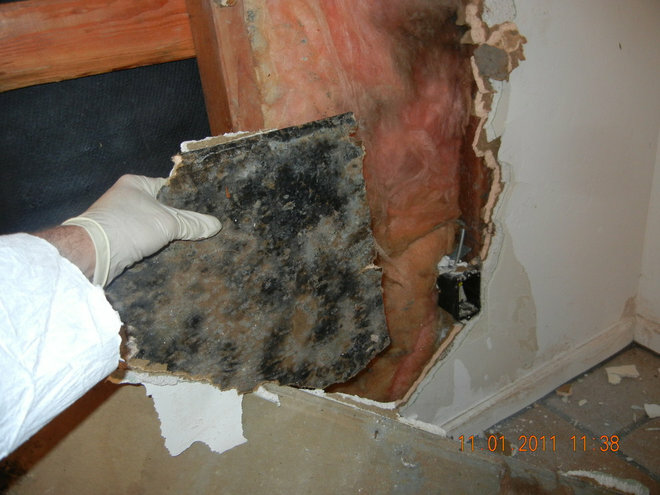 “If your house is closed up for two to three weeks, mold can start growing everywhere,” he says. Within two to three days of water receding, you should return to your home to remove everything that was touched by water. 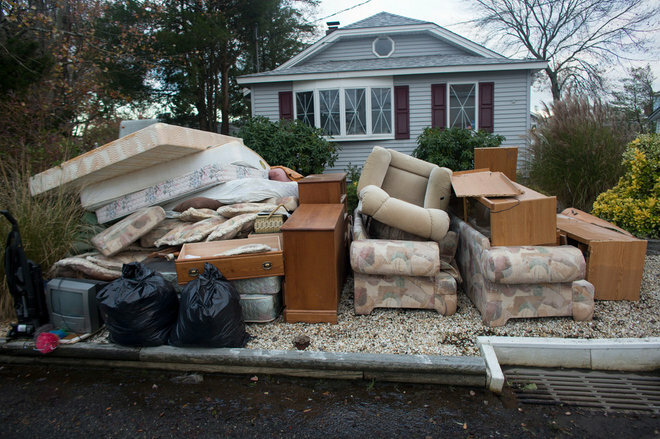 Most homeowners will tackle the initial stages of clearing out water-soaked furniture, appliances and carpet, as well as removing drywall. This is a pretty straightforward task, easy enough for the average homeowner, Risinger says. But for those who aren’t able, there are volunteer organizations, religious groups, neighbors, friends and contractors like Risinger who are offering to help. 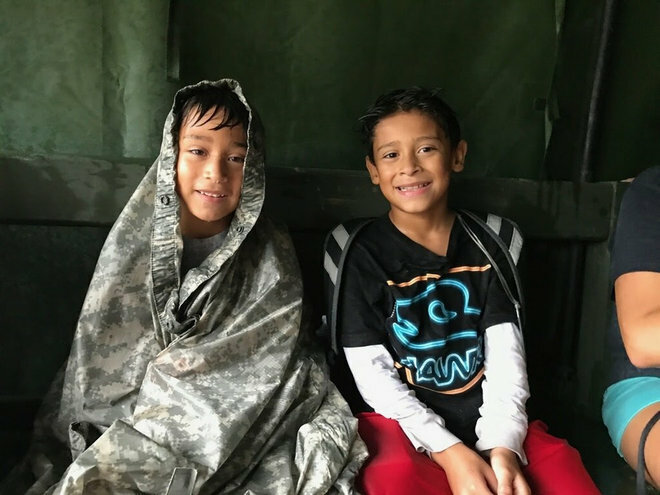 Groups like Team Rubicon, a nonprofit organization that recruits, trains and deploys military veterans for disaster response, especially to homes that lack insurance, are on the scene in Houston as well. In a book published by FEMA and the American Red Cross titled Repairing Your Flooded Home, the organizations agree that people can do a lot of the cleanup and repairs themselves, but advise people to seek professional help if they don’t feel comfortable with it. 1. Get personal protective equipment, such as rubber boots, gloves and clothes.Risinger advises that you protect yourself first with the proper gear, especially for your lungs. Flood water is nasty stuff, containing hazardous chemicals and raw sewage, the residue of which gets left behind after the water recedes. What’s more, lead-based paint particles can also get stirred up, especially if your home was built before 1978. Not to mention the dust and mold spores in the air. So play it safe and protect your lungs. Risinger recommends an N95 mask (he prefers this one) or a half-face P100 respirator. 2. Cut off power, gas and water. Before entering your home, be sure to turn off gas, water and electricity. HUD also recommends assessing your home’s structural integrity before entering, and getting a professional inspection if you’re unsure. If the waterline was above the electrical outlets, Risinger recommends having an electrician come out as a precaution to make sure everything is OK. But he says that nine times out of 10 there won’t be any problems to the mechanical components in a house after a flood. The vast majority of the damage will be to the materials. 3. Remove everything. Take everything that was touched by water out of your house. Set any solid wood furniture out to dry, as well as family photos, but toss everything else. Rip out the carpet and carpet pads. 4. Demo everything to the studs and concrete slab. 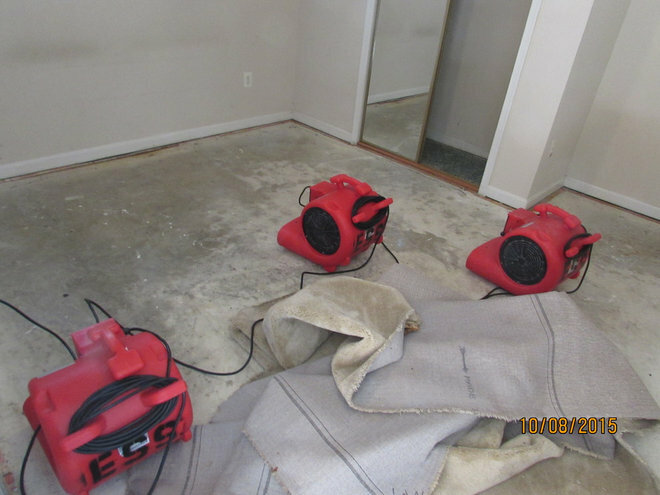 Risinger says some hardwood floors and solid wood trim might salvageable, but for the most part, you’re looking at stripping your home down to its concrete slab and wall studs above the line where the water reached. 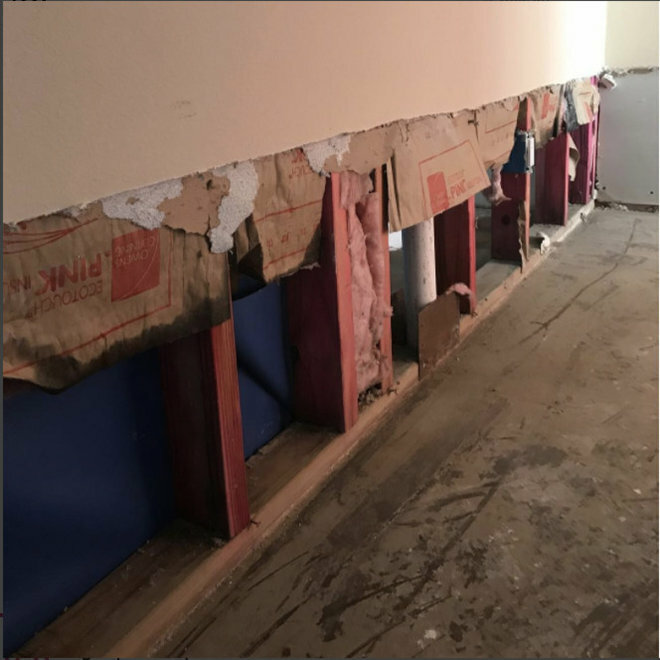 Demolishing the portion of your drywall that was damaged by water is a task easy enough for the average homeowner, Risinger says. Once the drywall portion is removed, cut the insulation and remove that as well. Don’t yank down the insulation, as that will leave a gap near the top of the wall. Tip: Risinger also recommends leaving a small section of your drywall as is so that you can show an insurance adjuster where the waterline was. 5. Don’t forget hidden spaces. Be sure to check drawers and other areas of your home for standing water. There may be water trapped at the base of your kitchen cabinets behind the toe kick. 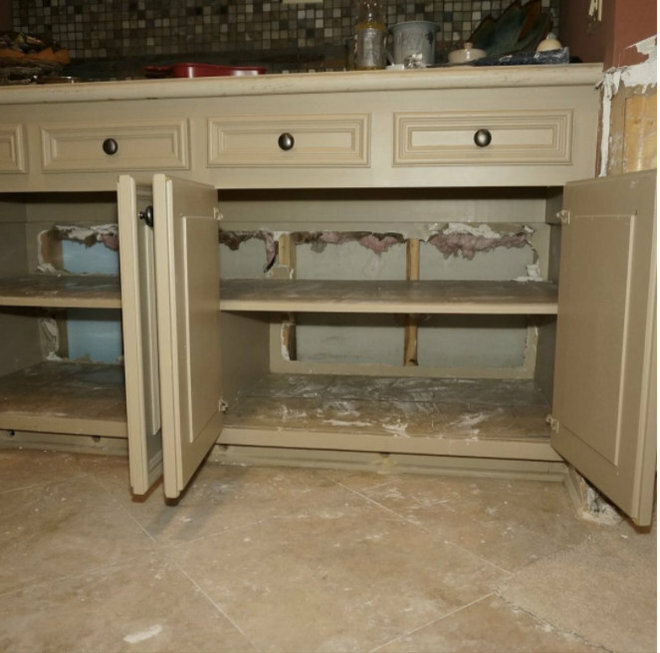 If you have a kitchen island, you may have water trapped in the base as well. Risinger recommends drilling holes in the base of the toe kick, as shown here, to release any water trapped there and get air circulating through. He says that replacing the toe kick and cabinet backs is relatively cheap and easy. Interior doors can likely be saved too. Take the doors off their hinge pins, stack them outside, lying flat with space between them for airflow. If they stand upright, they are likely to warp. Put a fan on them to facilitate the drying process. 6. Clean and disinfect. Get a broom and a shop vac and really clean everything out. 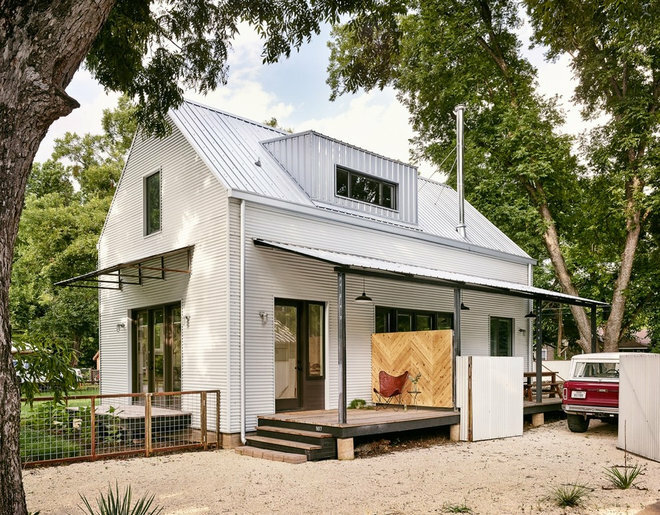 Risinger suggests even hosing down the solid surfaces — studs and slab — with clean water. This can help wash away bacteria, he says. Don’t powerwash or get the drywall wet, though. Once everything is relatively dry, you’ll need to use something to kill the bacteria. Risinger says Microban is a good option, but you should wear a mask, gloves and goggles when using it. He also recommends creating a bleach solution of half a cup of bleach in 1 gallon of water and using a pump sprayer to spray everything but metal in a fine mist. Bleach will corrode metal, so avoid spraying things like electrical outlets and cabinet hardware. “Spray it down, put fans on and let it dry,” he says. On dry days, open all the doors and windows. Should you stay in your house after demo? Risinger says a lot of people are staying in their homes and will likely live with a partially demolished house for months or even years as they wait for insurance money to come in or save up enough to rebuild. The exterior shell of most houses will be fine once dried out. So even after you remove the interior drywall and insulation, you’re still protected from the elements with the exterior shell. As for adding new drywall, Risinger says an amateur can do the work. It might not be cosmetically as good as you want, but you can always return to it in a few months or a year and hire a painting contractor to make it look better. “In the meantime, put your life back together,” he says. Once you are ready to start rebuilding with the help of a professional, Risinger says to be patient and cautious of scams or contractors looking to move too quickly. “I think it’s going to be ugly, unfortunately,” Risinger says. “Be on your best vigilance. Don’t be overanxious to rebuild, and really take your time to check references.”Talk to or visit your potential contractor’s previous satisfied customers. Don’t be afraid to ask them hard questions, such as if they feel as though they got their money’s worth, if the contractor followed through with what was promised and if any surprises came up. “Do that for multiple people,” Risinger says. 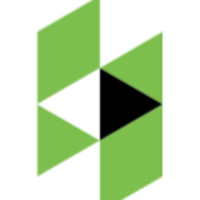 HUD urges homeowners to check credentials and hire only licensed and insured contractors. If you plan to stay in your house for the foreseeable future, know that it will likely flood again someday. 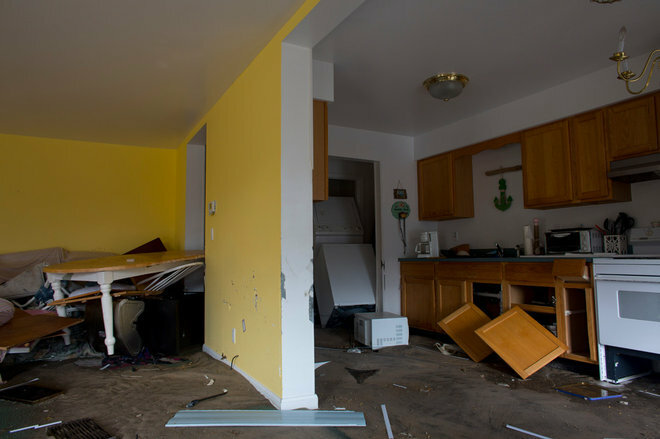 In Repairing Your Flooded Home, FEMA and the Red Cross recommend that as you begin to rebuild, it’s the time to introduce flood-proofing materials and practices, and to buy flood insurance and write a flood response plan.